This five-level ramp (four supported and one slab on grade) is two bays wide and constructed entirely of cast-in-place post-tensioned concrete. One of the challenges of this project was the restricted site, which is tight at the back of the ramp on the east side because of the adjacent property’s higher elevation. Temporary shoring of the soil in that area was necessary to maintain the integrity of the higher ground during construction. A culvert siphoned off excess water, however, with the culvert in place, there was no room for equipment to backfill along the east side, so a large mobile conveyor was used to transport the backfill from seventy feet away. The soil was then hand leveled and compacted. The foundation was originally designed as steel pipe piles driven to bedrock, but when soil borings showed the rock deeper than anticipated and large boulders in the subsoil presented potential obstructions to driven piles, vibro-compaction and 7-inch diameter steel pipe piles were re-bid as options to the larger 9 5/8-inch diameter steel pipe piles originally specified, and foundations were redesigned as spread footings at a bearing pressure of 1200 pounds per square foot. The post-tensioned concrete structure uses encapsulated post-tensioned cables and epoxy-coated reinforcing bars. All reinforcing is with high performance concrete and 2-inch top cover. Typical bays are 24’-10″ by 60′-0″ with the overall length at 386′-0″. An expansion joint with double columns is used at the center of the ramp. 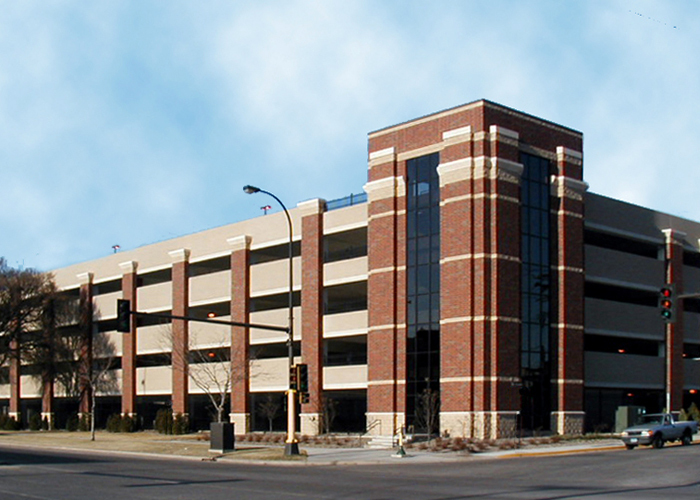 Vehicle barriers along the edges are precast concrete spandrel panels, and masonry piers with brick veneer cover the exterior of the concrete columns. 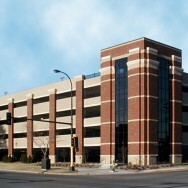 Stairs on either end of the parking ramp are isolated from the parking ramp with an expansion joint. The south stair/elevator lobby is designed to accommodate a future skyway across Stinson Boulevard.